An anonymous writer for the New York Tribune stands at 154 Nassau. The writer asks passers-by a simple question: “Do you think this is a good world?” It’s just four months after Armistice Day, and on the tail of a flu pandemic that killed 55 million worldwide. The writer publishes five answers, ranging from “damned rotten” to “the finest”. Producer Ula Kulpa stands at the same spot and flags down passers-by 100 years later and asks the same question, “Do you think this is a good world?” Today, life expectancies are up, yet we still fight wars. We are still sometimes cruel to loved ones and strangers. 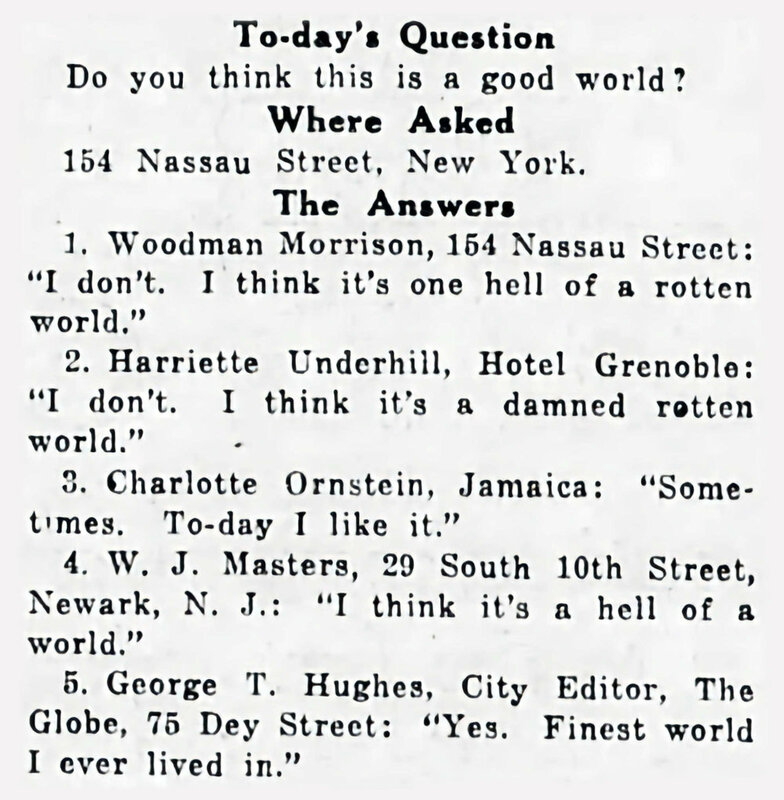 So, with the perspective of an additional century, what do New Yorkers think about the world’s goodness? This episode is a collaboration with the podcast Going Forward. Going Forward is produced by Julia Drachman and Ula Kulpa. Jeff Emtman did additional editing on the piece. Jeff Emtman is visiting Copenhagen to teach a masterclass on sound design and to do a radio cinema event about sound’s haunting nature. Join him at Radiobiograf, Copenhagen’s Radio Festival.